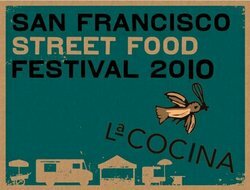 The San Francisco Street Food Festival is a fun-filled foodie day, hosted by La Cocina, that advocates for the creation of policies that support the formalization of mobile food vending in San Francisco. (Try saying that in one breath…wait-not with your mouth full!) Save the date for an e.z. 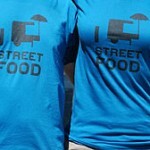 one-stop chance to sample some of the best street food from over 40 mobile food carts usually found roaming the streets of SF. Treat your buds to some mighty tasty bites, starting with Azalina’s Malaysian cart (Chicken and Beef Curried Meatballs with Sticky Rice Triangles) ending with Zella’s Soulful Kitchen (based on her Granny’s southern comfort-food recipes). 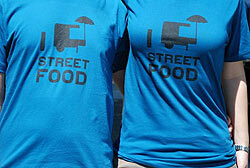 Attire is casual, but if you want to really dress the part, you’ll fork over $25 for an “I Cart Street Food” T-Shirts. La Cocina is a ground-breaking business incubator designed to reduce the obstacles that often prevent low-income food entrepreneurs from creating successful and sustainable small businesses. By providing affordable, shared, commercial kitchen space, an array of industry-specific technical assistance and services, and access to market opportunities, La Cocina works with entrepreneurs as they launch, grow, and formalize successful food businesses. The organization’s vision is that program participants become economically self-sufficient and contribute to a vibrant and diverse economy doing what they love to do. For more information, visit www.lacocina.org.